Villa Ismini is a split level villa with three floors joined by a central spiral staircase. Front door opens into the comfortable living area which has a balcony overlooking the pool. The property has a living area, large kitchen/dining area (with separate sofa bed area for an extra person), 2 bedrooms (1 double and 1 twin) and 3 bathrooms. An additional bed can also be provided if requested. If an additional bed is required there is 1 folding bed. Villa Ismini can sleep up to 5 people. Sunloungers are provided on the paved terrace surrounding the private swimming pool. Next to the pool are chairs and a table with parasol making this an ideal place for breakfast. A special feature of Villa Ismini is the wonderful outside kitchen with barbecue set just beside the pool. This is a covered area with large barbecue, pizza style oven, full fridge and sink. There is an additional dining table and chairs to take full advantage of al fresco dining. Comfortable, well equipped and secure villa with a great pool and terrace. The bedrooms are a little small but there is plenty of space overall. We didnt use the outdoor kitchen as it was too hot in August to contemplate burning wood or charcoal! Really useful having an "open all hours" mini market just down the road and a good quality restaurant (Persas) on the doorstep. Kato Katelios (15 minute walk) is a bustling little place with plenty of bars and restaurants to choose from. The bay is beautiful but the beach is quite shingly so we drove to sandy Kaminia beach just round the headland on a couple of days. An excellent holiday overall on a beautiful island. 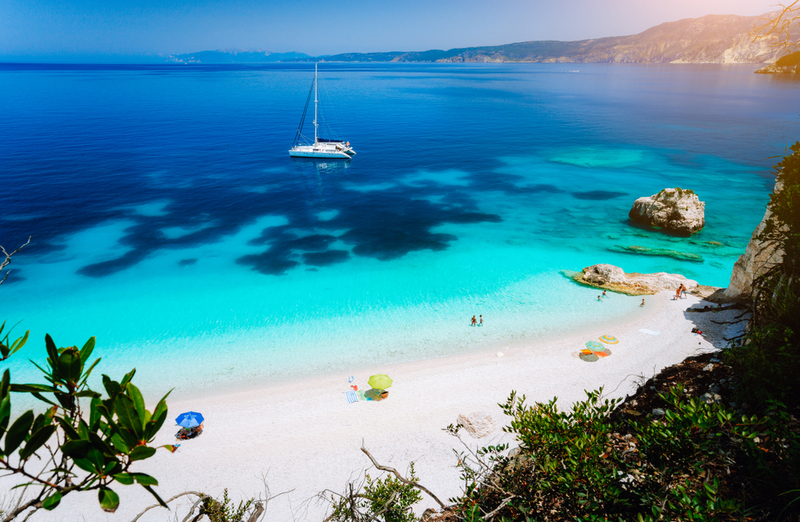 Kefalonia is a beautiful island and Villa Ismini is in a superb location as near a few tavernas and a supermarket to stock up on essentials for our stay. The beach and beachside tavernas are only a short walk away. Villa Ismini is a lovely villa with a superb pool which our two kids (age 6 and 9) couldnt keep away from! It was very hot when we were there so the air conditioning in the bedrooms was much needed. A beautiful villa in a superb location. An enjoyable stay in a well prestented villa. Excellent holiday very friendly polite Greek people wherever we went.First class food and a great place to relax. Many thanks to the Agni Team. Perfect description 100 percent accurate. The Cleaning Maid Ada and Caretaker Thimios were first class and both very polite and cheerful characters. In August 2017 we had a fantastic 9 day stay at Ismini Villa and would highly recommend it. The Villa is ideal for 4 people. It is perfect for a relaxing holiday close to excellent restaurants a mini market and a wonderful bakery. You can walk to the beach but we preferred the 5 minute drive. We would definitely visit again. Semi detached house with all facilities one would ask for. Easy drive from Agostoli and easy to find. Lovely well kept pool and area. 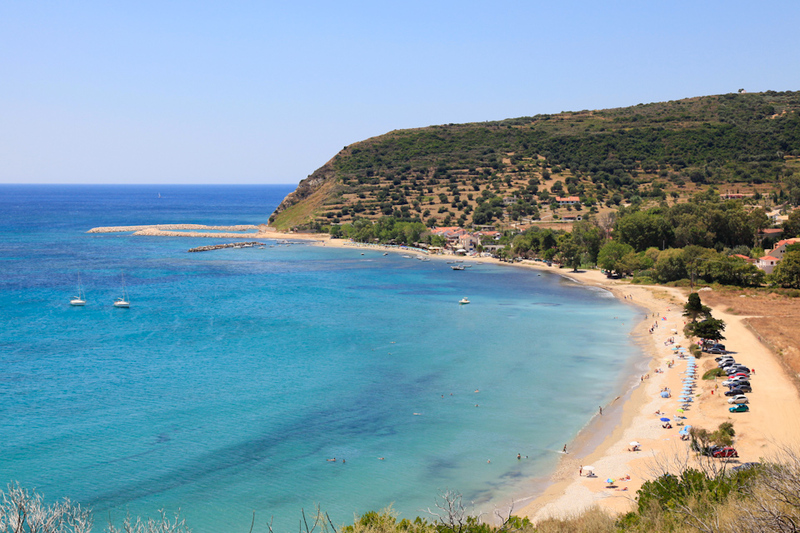 Good location close to Katelios beach with plenty of tavernas and good safe swimming. Free sunbeds to for Taverna users which is a bonus. Car hire would be essential if you wanted to more of Kefalonia. We really enjoyed our stay at Villa Ismini the villa was lovely and we would recommend to friends. Our third stay at Villa Ismini and as always a wonderful holiday. The villa is very well equipped and always clean and well maintained. The views are wonderful and it is in a quiet setting with a great pool area that gets the sun all day but has plenty of shade from the heat of the day too. A fifteen minute stroll down to the seafront and lovely tavernas. We would definitely recommend Villa Ismini to anyone wanting a quiet holiday in lovely surroundings and everything you need within walking distance if you do not want to rely on a car every day. As always great service from the Agni Team and maintenance of the villa. Vila Ismini is the most amazing villa. The villa was scrupulously clean on arrival and this was maintained throughout our stay by the excellent maid Ada. The caretaker Thimios too was excellent - meeting us on arrival (an early check in) and showing us around the house. He was very attentive to our needs and sorted problems very promptly. The views from the villa are wonderful and the surrounding area peaceful. There is a wonderful pool and an excellent and well equipped kitchen. It is conveniently near a mini market and a short (15 minute) walk into Katelios with beach bars and a wide range of restaurants. Thank you to Ada Thimios at the villa who made our holiday special and to Megan at the Isle of Wight office who helped us when there was a threatened airstrike. The car hire rep was waiting for us in the arrivals hall and the only car hire company who has talked us through the car features routes and any road difficulties. An excellent service. The car was in excellent condition. A rather wonderful 'get away from it all' holiday. Villa was stunning and in a great location. Lovely Ada the maid came in most days and we were very well looked after. Agni Travel have been very helpful and kept in touch to make sure everything was ok. I would definitely go back. We had a fantastic holiday. Would not have changed anything. Agni Travel were there if we needed with prompt responses when we needed help/advise. Will definitely use again. Many thanks. Our second stay at villa Ismini and just as we remembered it. A wonderful villa in a quiet village a real get away from it all holiday We would certainly book another holiday with Agni Travel in the future and definitely recommend it to others. The villa had everything you could need and is beautifully maintained a wonderful pool and fantastic views and just a ten minute walk to the village. The holiday was fantastic. Kefalonia lived up to all our expectations - beautiful, unspoilt. welcoming and hospitable. A great place to relax enjoy and recharge your batteries. We had a fabulous week staying at Villa Ismini in Katelios. The Villa is immaculate and ideally suited for four adults. The spiral staircase gave our legs a great workout The villa was cleaned and fresh towels were provided every day. The village is small but has enough choice of bars and restaurants to visit over our weeks stay. Best food - Dreams beach bar. Delicious home cooked food. Fresh sardines caught that morning by the owners son. Best Bar - cocktails at the bar overlooking the beach with a view across to Zakynthos. Highlight of the holiday was seeing turtles in the harbor in Argostoli. Amazing. Thank you Agni Travel for a great holiday. Everything was exactly as described on the website. A lovely villa with charming staff. We shall return. Villa excellent, maid was excellent, she couldn't have been more helpful . Many thanks. We have just returned from a week in Villa Ismini on the beautiful island of Kefalonia. The villa was outstanding. Very clean and well equipped with a lovely outside area. There was a nice, friendly maid who came in and a very helpful caretaker. The resort of Katalios is small and friendly. There are loads of tavernas by the beach and a nice stretch of beach at the other end of the bay. The beach was quite stoney as you walk into the sea so beach shoes would be advisable. Only a short walk from the villa is a very well equipped mini market and a bit further along is a bakery. There are 2 tavernas within easy walking distance. We can recommend Jerrys where you can sit in the garden surrounded by beautiful plants and flowers. 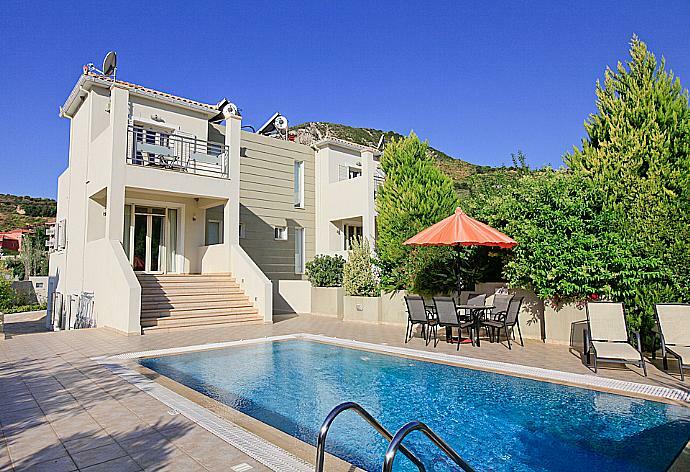 Kefalonia is beautiful and the villa is in a lovely setting with mountains on one side and the sea on the other. We can highly recommend it. You will not be disappointed. We are already planning another trip next year. Great place for a relaxing holiday in a lovely private villa. What a wonderful villa in a wonderful place. From the moment we were greeted by the owner and the maintenance man, to the huge hugs we received when leaving, it was two weeks of sheer bliss. Even the three cats made us welcome. A small mini-market provided all that we could want and the walk into the main village took us past villas and tavernas - even a melon field. This is the second year that we have stayed in Katelios and we are seriously thinking about returning next year - to the same villa. Thank you again - we would recommend Agni Travel to everyone. Agni Travel are by far the best holiday agent we have ever used and I would thoroughly recommend them to anyone. We will definitely be coming back and definitely with Agni Travel. We absolutely love Kefalonia having been twice before to Katelios. The couple who looked after the villa were just wonderful, so friendly and kind. The villa had everything we could possibly want for a good holiday. I have put a review on Trip advisor which I hope will be read by others. A very nice villa, we really did enjoy our stay.Thanks for all your help and advice, a lovely villa in a lovely little village on a lovely island. We were worried that after looking at the photos of the villa that it wouldnt be as nice but it was lovely. Very clean and modern with everything you would need for a home away from home. Very impressed. This was first class accommodation with a company that went that little bit further to help us and keep us informed.I would definitely recommend this villa to friends and family and would be looking to use Agni Travel again next year. The situation of our villa was perfect for us the area was beautiful and we are about to book flights out to Kefalonia for next summer. The restaurants are fabulous the beaches perfect for us and our 2 young children and it is easy to escape from the touristy bits and find the gems. Gorgeous place and wonderful holiday.